You can easily add our wonderful app to your phone’s homescreen to function just like any normal app. Just follow these easy to understand instructions listed below…. Type www.greatbigsmiles.com into your web browser (it needs to be Safari) and go to the home page of our app. 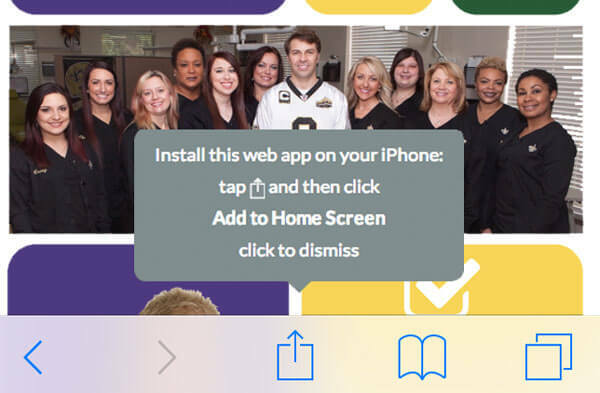 Once on our app’s home page, select the button shown below, then select “Add to Home Screen.” You must be using the Safari browser to view the app in order to see this option. Now you are ready to start using our awesome app! In the bottom right corner, click on the 3 dots and select “pin to start” to add to your home screen.